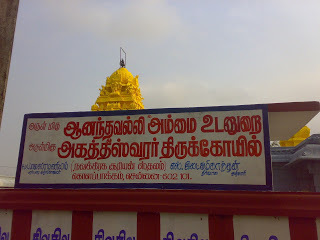 Sri Agatheeswarar Temple is located in Kolapakkam, Chennai. Agastheeswarar Temple is one of the ancient temples of India and this temple is dedicated to planet sun. 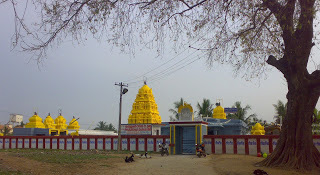 This temple is the surya parihara sthalam. 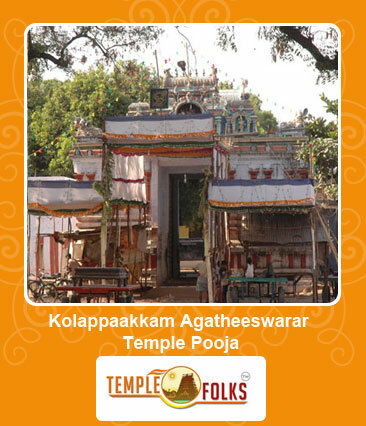 The Main deity of kolapakkam Agastheeswarar temple is Sri Agatheeswarar. The temple is built facing south. Agatheeswarar is seen facing east. The Sthala Viruksham for this temple is Arasa Maram. Theertham of this sthalam is Amirtha Pushkarani. This temple is said to be over 1300years old. Surya is the only visible God whom we can see, perceive and pray. The Sun God is considered as the life-giver, ''Prannadata'' of the entire universe. Surya is essential for life. All Vedas regard Surya as the witness (Saakshi) of all actions. The Sun or Surya is also known as ''Atmakaraka''. Sanskrit word, ''Atma'' means ''soul'' and ''Karaka'' means ''indicator''. The Sun is the ''indicator of the soul''. The Surya is the indicator of our ego, honor, status, fame, the heart, the eyes, general vitality, respect and power. Surya Puja or Sun Worship is dedicated to Lord Surya. Grah Shanti Surya Puja or Sun worship is recommended to those, having malefic surya or wrongly placed sun as per the horoscope. By Worshipping god suryan who recovers us from the doshas.